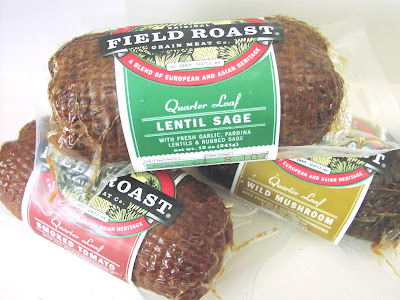 For years people in the Northwest have had access to one of Field Roasts’ original products; the Quarter Loaf. As a netted wheat based vegan meat, they are akin to the Celebration Roast, though not stuffed, and come in three distinct flavors. Lentil Sage with pardina lentils, rubbed sage, garlic and lemon juice, Wild Mushroom with shitake and bolete mushrooms, & Smoked Tomato with garlic, tomatos and hickory smoke…a far cry from usual bologna veggie meats, our flavors are plant based and resonate with real food. These hunks of Field Roast have been given a new life thanks to our customers! You’ve given us so much feedback that we just could not ignore you any longer! We have finally started peeling the netting off to allow you to open the package and chunk it up; no fuss, no muss. If you have ever had a Quarter Loaf at home, you know that the netting would grab onto the meat and tug out pieces of the loaf, leaving you with less than you started with! This was avoidable only by cutting the netting in serveral places and slowly removing the threads of the net. Malcolm sourced out a new smaller netting, tested it out, and found that the smaller holes didn’t let the meat push through during the steam process and voila! easy to peel Quarter Loaves! We are hoping now to shine the spotlight on these and get more distribution across the country. Until then, it will still be only available in the Pacific Northwest, sorry!